I get it. E-Design? What? How? It's hard to envision what the process of E-Design looks like and how it would work for you. But it could be the missing piece between your current home and your dream home, so let's break it down. E-Design is a middle ground Interior Design service. While full-service Interior Design completes the design of a space, E-Design gives a homeowner the tools and instructions to complete the design on their own time. There are a few steps that will make the process clearer -- so let's start there. The first step in E-Design is getting the designer all the information needed to create a perfect design for you. For us, that includes completing our questionnaire, supplying space measurements, photographs from various angles, and inspiration pictures. This is when I like to hear everything that you are looking for, your level of handiwork and what you really want out of this space. 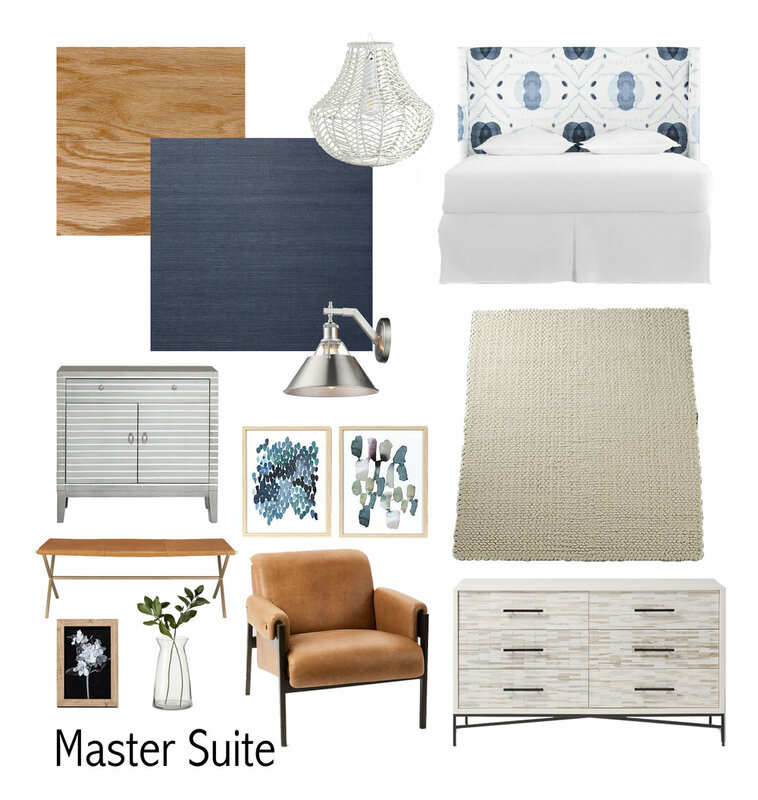 After I get all the details about your vision and your current space, I create a mood board. Typically this includes finishes, swatches, furniture pieces, inspiration photos, and any other detail that will help you envision the direction of the design. Typically this will include a few options for us to discuss and decisions to finalize. At this time I like to Skype with you so we can get clear about what you love and what you wish was different. Together we finalize any decisions that need to be made or answer any questions that need to be answered. A short time after the Mood Board is finalized, the completed design plan will be handed off to you, the homeowner. This will include floor plans, spacial renderings, a shopping list, details, instructions, and anything else I think you will need to make this design your reality. Think of it as your interior design cheat sheet. The Design Plan will guide you through every purchase and paint stroke to make the space we designed together, come together. This part is where the real magic happens, and it's up to you. The Design Plan is your tool to bring the space together. Purchasing decor, completing DIY projects, rearranging floor plans; it's all dependent upon what your Design Plan has set up for you. Don't worry! It takes into account your comfort level with projects of all sizes. The beauty of E-Design is that this phase is completely up to you. You can choose to complete the full space transformation in a weekend or in stages, with the help of a friends or family, or a professional. It's all on your time, your budget, and your schedule. There are no rules or deadlines with you designing your space - and that's the best part. All that is left now is for you to enjoy your newly designed space! Room makeovers of all sizes can benefit from E-Design and it's so adaptable that truly anyone can use it as a fast pass to a beautiful home. If your guest room needs a revamp for your mother-in-law's upcoming visit or if your kitchen needs some love and you just don't know where to start, E-Design might be your answer. If this design process makes you curious, let's chat about it! This is a broad explanation but if you need a clear vision of how this could work for your specific design needs, please let me know. At the end of the day, E-Design is all about coaching you to see what could be, so let's start brainstorming together.